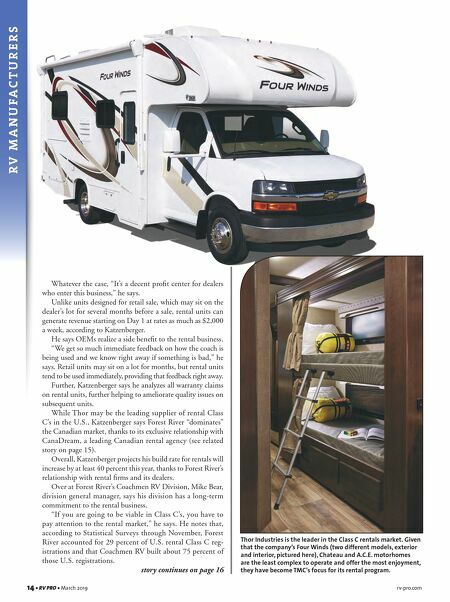 rv-pro.com March 2019 • RV PRO • 15 Rental Agencies Power Market No story about Class C rentals is complete without a few words on the leading commercial rental agencies. Cruise America, an employee-owned RV rental and sales company based in Mesa, Ariz., was founded in 1972 and has his - torically held a premier position in the U.S. RV rental operations market. It operates at 132 locations in the U.S. and Canada with about 300 employees at peak season. At its apex, its fleet num- bered 4,500 vehicles, mostly Class C motorhomes. One of the keys to Cruise America's longevity, according to Executive Vice President Michael Smalley, is being aggressively proactive. "We continue to reinvent the RV experience by delivering modern day service along with top-quality vehicles to vaca - tioners from around the globe," he says. "Today, though, I am thinking more about Cruise America's future than its past. The RV rental outlook for 2019 is bright and will become even more popular as travelers seek a unique adventure that only an RV vacation can provide." There was a time when the industry leader could accurately calculate its position in the rental market, but the creation of so many peer-to-peer entities in recent years "has made it hard to gauge the actual size of the market place," Smalley says Cruise America's relationship with Thor Industries spans almost three decades, when Cruise approached Thor to build pur - pose-built rental RVs for the company's customers. Thor remains one of Cruise America's leading suppliers, but the company also offers units from other OEMs, such as Winnebago, and Lance. Global tourism operator Tourism Holdings Ltd. (THL) is the largest provider of RVs for rent and sale in Australia and New Zea - land and the second largest in North America. It is the parent com- pany of El Monte RV and Road Bear RV Rental & Sales. THL is a 50-50 partner, along with Thor in the U.S. holdings. About half of the rental business for El Monte RV comes from overseas travelers who fly in to various cities throughout the U.S. The company's history dates back to 1970, when it was founded in El Monte, Calif., by Ken Schork. Road Bear RV Rental & Sales was founded in 1980 as a camper van manufacturer and later launched its rental service. It has eight locations: Denver, Las Vegas, Los Angeles, New York, Orlando, San Francisco, Seattle and Dallas (drop-off only). Founded in the 1990s, CanaDream has grown into one of the largest RV rental and sales companies in Canada. While CanaD - ream is based in Canada, its fleet of about 1,000 RVs can be seen on the road throughout both Canada and U.S. In 2017, CanaD- ream became part of the Apollo Tourism & Leisure Group of companies, a global RV rental and sales group based in Brisbane, Australia. 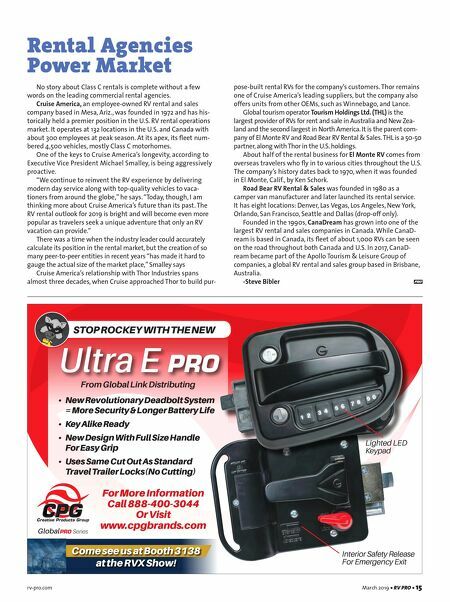 -Steve Bibler • New Revolutionary Deadbolt System = More Security & Longer Battery Life • Key Alike Ready • New Design With Full Size Handle For Easy Grip • Uses Same Cut Out As Standard Travel Trailer Locks(No Cutting) Ultra E PRO For More Information Call 888-400-3044 Or Visit www.cpgbrands.com From Global Link Distributing Lighted LED Keypad Interior Safety Release For Emergency Exit STOP ROCKEY WITH THE NEW Come see us at Booth 3138 at the RVX Show!